Ever wished you could send a video message on iOS; but instead of your own face you look like an emoji? Animoji might be for you. Announced at the September 12 Apple Event, Animoji is a new feature included as part of iOS which sends "animated emojis" in iMessage that respond to your own facial expressions. Above: Animoji being announced at the September 12 Apple Event. Make a frown, the emoji will frown. As you talk, the emoji mouth will open and close to match this. Animojis aren't just visual: your voice is recorded when using Animoji. Each "emoji" has its own voice. It appears this feature uses voice modulation. The Unicorn sounds "horsey" and the alien sounds suitably extra-terrestrial. Animoji has no bearing on how the existing emojis work in iOS. The regular emoji keyboard is not animated, nor are emojis used in any text field. The only place Animoji can be found is within the Messages app. If you are using other apps such as Facebook, Twitter, Instagram, or Safari the emojis will not animate, or respond to your facial expressions. 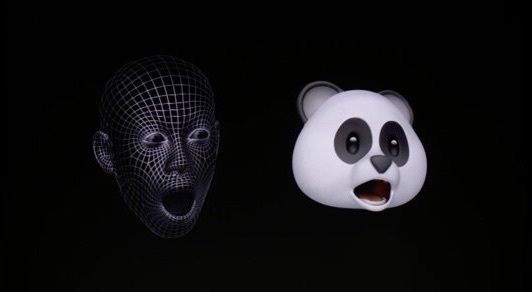 Above: Animoji uses the iPhone X depth sensor to respond to your facial expressions. To use Animoji, open Messages on iOS, tap the "App" icon next to the input field and tap the Animoji iMessage app. Now choose an emoji, and hit record to create a message. This isn't just visual - your voice is recorded too. Above: Craig Federighi demonstrates the chicken Animoji on stage at the September 12 Apple Event. The result of your recording is a video of a cute (or creepy) emoji which appears to read your message back out, mimicking the same facial expressions you used when creating it. Your voice is also modified to match the character chosen. Once an Animoji has been recorded, this can be replayed, or sent to any other iMessage user when ready. Animoji is no replacement for how we use regular emojis today. It doesn't help give context to a text message, and it's not quicker either. So why bother? Think of Animoji more like Snapchat filters, but instead of a filtered face, the emoji is your face. This is a novel way to send video messages that will be sure to make someone smile. If you consider this a video-message feature with filters instead of any variation of emojis as-you-know-them, Animoji makes far more sense. Best case scenario: send some amusing messages to friends and families where the panda, unicorn, or poo wish them a happy birthday or other greeting. The face tracking technology looks very impressive. Worst case scenario: ignore this particular iMessage app and continue using regular (non-animated, silent) emojis as you normally would. Animoji requires the new hardware capabilities of the iPhone X which ships on November 3, 2017. While not yet announced by Apple, it's possible this will come as part of an iOS 11.x update at the same time as the iPhone X release. iOS 11.0 was released to the public today, and it does not contain any emoji updates. Update: iOS 11.1 has new emojis and comes out late October or early November 2017.